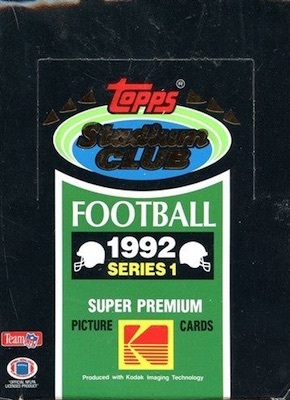 Similar to the other Stadium Club releases in the early 1990s, 1992 Stadium Club Football features full-bleed photography and a premium finish. While the product does not have any huge rookie offerings, the Brett Favre card in the High Number Series has proven to be one of the most notable non-rookie base cards of the decade. 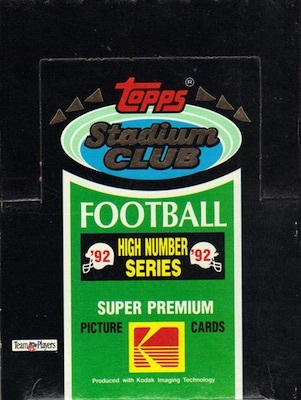 The 1992 Stadium Club Football base set is split into three releases and totals 700 cards. The first two Series releases consist of 300 cards each and the High Number Series contains the remaining 100 cards. While Series 1 and Series 2 were issued in normal quantities for the period, it is believed that only 300 cases of the High Number Series were produced. 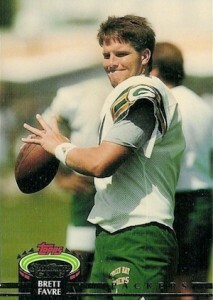 Despite not being an official Brett Favre rookie or even his first Stadium Club card, the Brett Favre card in 1992 Stadium Club Football is more valuable than any of his base rookie cards. 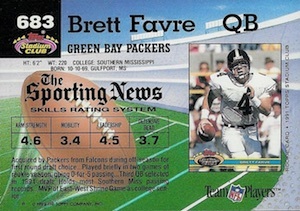 The appeal can likely be attributed to the limited nature of the card combined with the fact that it shows Favre as a member of the Green Bay Packers. His 1991 Stadium Club rookie card, shown on the card's back, covers his brief time with the Atlanta Falcons and actually misspells his last name. The Brett Favre card gets most of the recognition in 1992 Stadium Club Football, but a handful of solid rookie cards can be found in the High Number Series, including Darren Woodson and Robert Brooks. While there are no base parallels, Members Choice subset cards can be found in each series. At 1:72 Series 2 packs, Football Legend cards are a tough insert pull and cover six elite quarterbacks. Found in High Number Series boxes, the final insert is #1 Draft Pick of the '90'S and features four players. While three of the players were actual number one picks, Rocket Ismail, who initially spurned the NFL for the CFL, is also included despite not being drafted first overall. 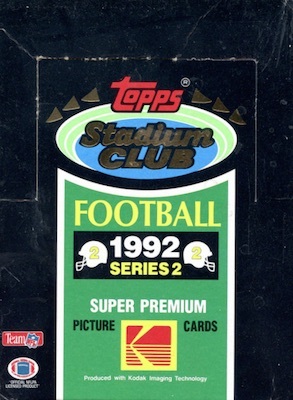 Also, Members Only cards may appear to be another insert from 1992 Stadium Club Football, but the six football cards, including Steve Young, Troy Aikman and Emmitt Smith, are part of a multi-sport set that was sent directly to Stadium Club members. Other than the Brett Favre card, the product offers an inexpensive option for collecting the NFL in the early part of the 1990s. Both Series 1 and Series 2 boxes can regularly be found for under $20. Due largely to the Brett Favre card, collectors should expect to pay $450-500+ for sealed High Number Series boxes. All three releases follow the same format of 36 packs of 15 cards. 700 cards. Series 1: #1-300, Series 2: #301-600, High Number (Series 3): #601-700. *Card #21 has an error and corrected version. MC=Member's Choice subset. 6 cards. 1:72 Series 2 packs. *Card #5 has an error and corrected version. 4 cards. Found in Series 3 packs/boxes. 2 sheets. Exclusive to 1992 NSCC. Here are the best deals on Series 1 boxes currently listed on eBay. Here are the best deals on Series 2 boxes currently listed on eBay. Here are the best deals on Series 3 boxes currently listed on eBay. 1992 Stadium Club BRETT FAVRE #683 PSA 10 GEM MINT!! 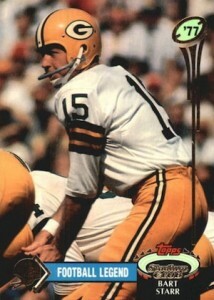 PACKERS HOF! !